Need to navigate campus, see class availability and location, or catch the next CatTran? Want to get UA sports updates, check your CatMail, or see how busy the Rec Center is with a simple touch? 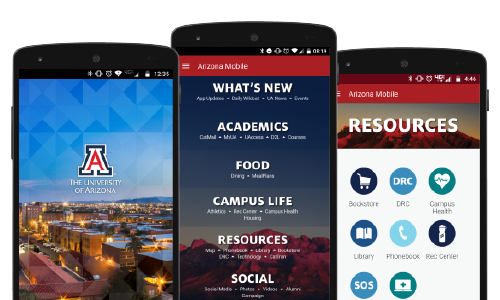 The Arizona Mobile app integrates the entire UA experience into a streamlined, live, and limitless interface. FREE download for iPhone®, iPad®, Android®, and available as mobile web. Your source for mobile development for and about The University of Arizona.